I was on R&R in late November, 1970, when the second big flood of the year drove CAP 2-7-2 out of our ville to LZ Baldy. When I returned, Doc Doggett gave me copies of the photos he took during that time. 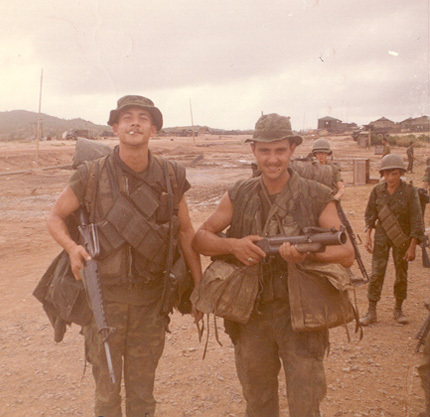 This one shows R.J. Carrier at left and Steve “Frenchy” Pelletier in full combat gear. R.J. is draped with bandoliers containing M-16 magazines and there’s a claymore in a bag under his left arm. Frenchy is carrying M-79 rounds in the green canvas demo bags under each arm.